Welcome to Year Two! I am Ms Judge and I am Year Two’s class teacher this year. I am very excited to be teaching in Year 2 and I am looking forward to getting to know your children. This year Mrs McNab will be supporting us in Year Two. We have an exciting and busy year ahead of us! In Art we have been sketching the SS Great Britain. Here are our sketches. In D.T we have been designing animal shelters. Here are some of the animals and shelters we have thought about. We have been exploring our Christian Value Thankfulness this term. We have painted pictures of different things we are thankful for. in Art, we have been learning about Diwali in R.E and in Art we have made fireworks to represent light. 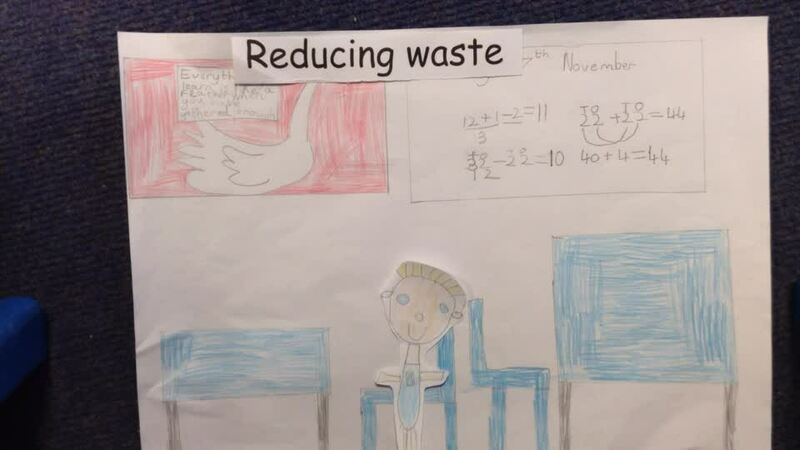 During green week we made animations and leaflets about how to reduce waste. Here are some of our leaflets. In Science and D.T we are looking at transport this term. Here are some cars we have sketched. Here are some of the backgrounds and characters we drew for our animation. We have been busy learning all about Andy Goldsworthy who is an artist and sculptor who works in the natural environment using natural materials. We had great fun going outside and collecting lots of natural things to create our own art, just like his. Have a look at our great work. This week, we have found out lots of facts about emperor penguins and we have sketched our own. This is our literacy working wall. We have been focusing on handwriting and punctuation this week. We have also been learning about nouns, adjectives and verbs. We have been learning about odd and even numbers in maths.